The Lifechoice ActivOx Pro portable oxygen concentrator is one of the smallest, FAA approved portable oxygen machines on the market weighing just 4.3 pounds (New Pro Model) and boasts the longest lasting internal batteryavailable among portable oxygen concentrators. Dependent on the setting, the ActivOX Pro provides up to 12.5 hours of internal battery life. Add the optional 3-hour external battery that weighs only .75 pounds and you can experience the freedom of having up to 15.5 hours between battery charges and the total weight of the system is barely 5 pounds! Please See the "frequently asked questions" section at bottom of this page for detailed battery run times at all settings. The ActivOx Pro is an on-demand oxygen concentrator with pulse setting options of 1,2 or 3 liters per minute equivalent of supplmental oxygen. 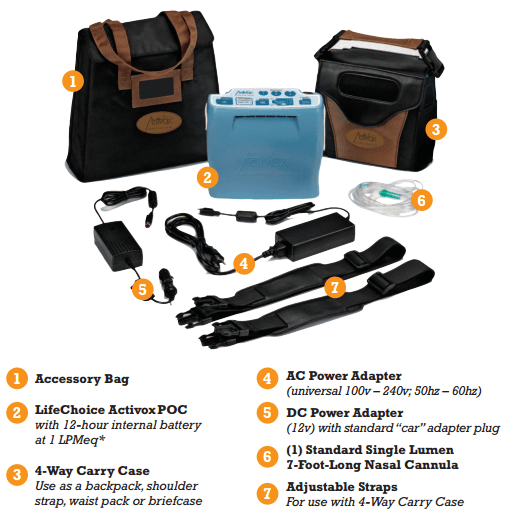 The unit comes standard with an attractive 4-way carrying case with adjustable straps which can be configured to be worn as a backpack, shoulder strap, waist pack or carried like a briefcase. The ActivOx can be powered and charged with the AC wall charger and the DC vehicle adapter that is included with the system. An attractive tote bag is also included to simplify carrying around your accessories. Due to the ActivOx's stylish look, small size, advanced battery capability, and amazing weight, oxygen therapy users find that they can better comply with their oxygen prescription and maintain a healthier, more mobile lifestyle. This unit may be one of the smallest and lightest portable oxygen concentrators available, but the device still offers you an industry standard 3 year warranty for added confidence. The ActivOX Pro Portable Oxygen Concentrator with patented Auto Mode Technology and Pulse Wave Delivery is capable of providing a source of oxygen 24 hours a day, 7 days a week. Auto-Mode is an inherent feature that automatically detects changes in your breathing patterns and adjusts the unit's breath detector sensitivity accordingly to provide oxygen during all levels of activity during the day and throughout the night while at rest. The Activox Pro oxygen concentrator utilizes Pulse Wave delivery which is triggered on demand by the user during inhalation. Pulse Wave delivers oxygen in a manner which is consistent with your normal inhalation rate. By contrast, the majority of portable oxygen systems utilize a Pulse Dose delivery approach. The user triggers the pulse during inhalation and the dose is typically characterized as a quick inital burst of oxygen at the beginning of your inhalation. This method of delivery exceeds your normal inhalation rate. Pulse dose oxygen is dispensed so quickly at the beginning of your inhalation that you can actually hear the "hissing sound" when the oxygen is delivered and you can feel the oxygen, as well. Pulse Wave works to mimic your normal inhalation rate. The Activox oxygen concentrator's ability to detect your inhalation early and deliver oxygen continuously during the first 30% of your inhalation cycle, means the oxygen that is delivered is actually received by you. This effective delivery means less oxygen is wasted, therefore, more oxygen is absorbed in the lungs. Pulse wave is a gentle and smooth transition to your natural breath so you no longer feel the oxygen being delivered which leads to more comfort, less sinus irritation, and better compliance. Another advantage of Pulse Wave delivery is that you no longer hear the "hissing" sound when the oxygen is being delivered which also leads to better compliance. The LifeChoice ActivOx Pro portable oxygen generator is virutally a silent oxygen machine that is great in settings where low noise is preferred. The ActivOx portable oxygen concentrator comes with a built-in Low Oxygen Sensor to alert you if the oxygen concentration ever falls below an acceptable therapeutic range. The unit also features a "No Breath" detection alarm in the event your tubing is accidentally disconnected or is kinked. The system is equipped with a battery check button and low battery alarm to help make you aware of when your battery gets low. Very quiet operation. Low noise from the machine and no "hissing noise" from the pulse-wave delivery! During All Activity Levels– Auto Mode supports your higher breath rates. As you participate in activities, your breath rate typically gets faster, thus having more breaths per minute, the ActivOx Pro is designed to keep up and detect a high number of breaths per minute so as to not miss any breaths. During Sleep or Rest– Auto Mode adjusts to be more sensitive in detecting breaths to maintain saturation during relaxation and throughout the night. When you sleep, your breathing patterns can change. Your breaths can become slower and farther apart. Thus less breaths per minute. Some users breath through their mouths making their breathing through their nasal cannula a bit shallow and harder to detect with some Portable Oxygen Concentrators. 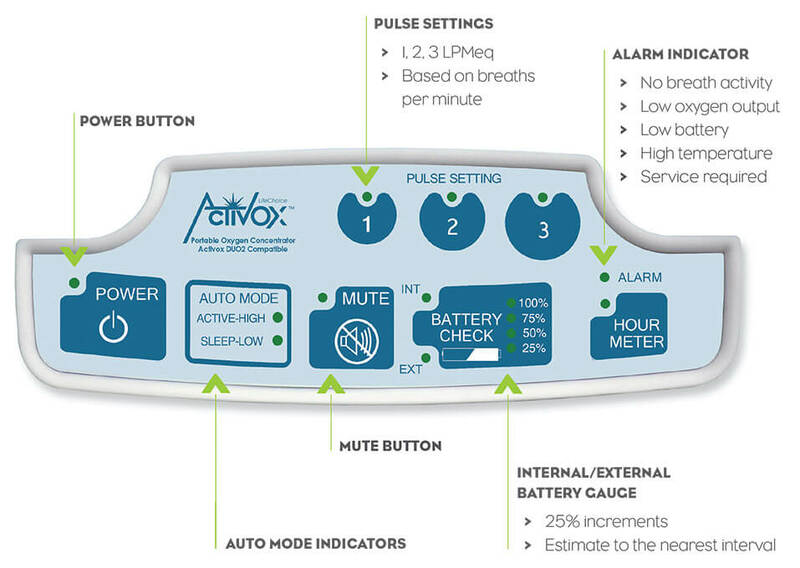 The ActivOx Portable Oxygen Concentrator is designed to detect these changes in breathing patterns and adjust the trigger sensitivity accordingly.